This post is about Swami Ramdev Divya Patanjali Sanjivani Vati which is known to be useful in case of fever & cold. I constantly face fever and cold problem on and off and thus didn't want to stick to allopathic medicines for frequent use, so thought of trying this Sanjivani Vati from Patanajli, since I have been really impressed by most of Patanjali Products, specially its Aloe Vera Gel, Toothpaste and Patanjali Shampoo. Along with this Sanjivani Vati, I also saw few other tablets at Patanjali shop like Medha Vati, Madohar vati, but bought only Sanjivani Vati and kept the others for the next visit. 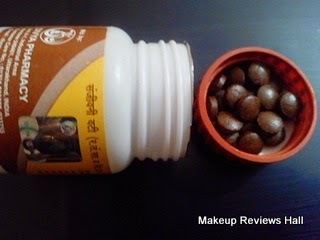 Read the review below to find out Divya Sanjivani Vati Benefits and Uses. It is a popular supplement best known as an aama digestive herbal tablet. More specifically, it is used in ayurved for fevers, rheumatoid arthritis, chronic disorders of digestive system including indigestion, lack of appetite, chronic constipation, mal-absorption syndrome etc. Advantageous in chronic fever, cough, cold, respiratory tract infections and other viral infections. Divya Patanjali Sanjivani Vati is the perfect supplement to assist normal functioning of the respiratory system. It also helps support a healthy immune system function. 1-2 tabs.of Divya Patanjali Sanjivani Vati twice a day to be taken with hot water/milk. 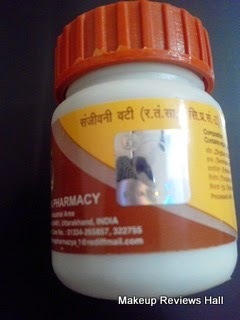 Divya Sanjivani Vati Tablets come in usual round white brown box like other Patanjali Tablets. The smell of this Sanjivani Vati is very strong and ayurvedic. The moment you open the box, you can feel its unpleasant smell right away. Divya Sanjivani Vati Benefits & Uses. Swami Ramdev Ji Divya Sanjivani Vati known to have infinite benefits and is a good medicine for cough, cold and flu. I have been using it since about a week and I been definitely benefited by it. I won't say that it helps in giving immediate relief from cough and cold, but it definitely shows its effect gradually and works on increasing the immunity slowly to fight against the common cold, flu and cough on overall basis. Divya Sanjivani Vati is said to help in controlling the fever and it makes your immunity strong to fight against any infection. I can't say anything about whether it control fever or not, because I have not been affected by fever since I have started using it but definitely it helps in getting rid of cold and cough. I can feel the internal difference in my body somewhat. I am more energetic and fit since I have started taking this Sanjivani Vati but more of it I could be able to judge in winters when I face the problem of cough and cold very frequently. Divya Sanjivani Vati is said to act as an energy booster by removing the number of harmful chemicals and toxins from body. As I said I do feel some inner strength after I have started taking this medicine but there is not huge difference in the energy levels of my body. In case of immunity, I do feel this is working quite nicely as an immunity booster since I am not that much affected by cold, cough or sore throat in recent days. I am a regular user of Swami Ramdev Divya Patanjali Products. I like most of them specially its Aloe Vera Gel, Hair Cleanser and Dant Kanti Toothpaste but main thing I love about these products is that they are ayurvedic and so affordable. The only problem with the Patanjali Products is that these are not available online so easily. This looks like an interesting product. one of our member has rhinitis and he is benefited great from the product.